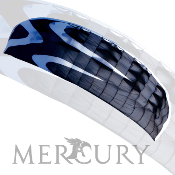 The MERCURY 6.5 is the largest power foil from New Tech Kites and will provide maximum power in lighter winds. The same smooth control of the smaller Mercury is present with the advanced bar system. The MERCURY line of power kites brings New Tech to the top of the class with safety and power merging into a high performance piece of kiting equipment. The German engineered foil and bridle system has the latest developments incorporated. Control is maximized with the advanced pulley system and the sail has all the quality features demanded by the traction enthusiast. It also boasts safety features like kite killers and a leash system. The MERCURY will allow the beginner to progress further, faster and safer and still deliver more than enough performance to keep even the most experienced pilot content. Includes Designer Kite Case and everything you need to fly! BY PURCHASING THIS KITE, THE BUYER ASSUMES ALL RISK AND RESPONSIBILTY OF ANY INJURY CAUSED BY ITS USE, AND HOLDS HARMLESS THE MANUFACTURER AND DISTRIBUTOR OF THE KITE. PLEASE FLY CAREFULLY AND RESPONSIBLY AND HAVE FUN!